Queries can be run from the command line or used via an external .sql-file. I prefer the latter method so I create 3 subfolders: “SQL”, “Logs” & “Results”. I copied the IIS logfiles to subfolders under LOGS. Mike Lichtenberg has a demo page with 50-examples to give you an idea what’s possible. Below are 2 simple examples that my customer wanted to have. What we do above is convert the date/time to a timestamp and group them by day (86400). If you replace 86400 by 3600 then you would receive stats per hour but the customer wanted to compare 6 months so we would have received too much output. Notice the ‘%cFolder%’ variable, I do this because there are numerous webservices and this way I can easily target a different subfolder. I also exclude a test-page that it is used by the hardware loadbalancer. Running this straight from the command line would be like this, notice how I pass the folder variable! 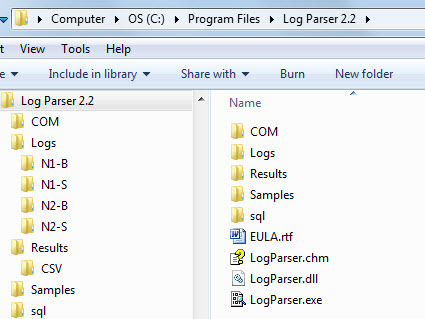 It works but not very handy so luckily LogParser supports other methods. Like CSV-export, don’t we all love that! Let’s try the command above again with some extra parameters. So, nicely formatted and we can now use this data to create graphs in Excel or in any other tool that supports CSV-data. You know now how it works so we skip the blabla and go straight to the query and the output. The possibilitied are endless so go ahead and try some queries on your own! !